There are a few more panels but OMQ's post has the best ones. yes what GoeticDisciple said,i skimmed through the whole thing looking for more Q but OMQ posted the best shots...omg i am looking forward to issue 9 with the Q gonna choke a Creem - edition cover. Ah, bummer. Looking forward to seeing next issue then. Who's rioting if they skip the scene coming up with Q and the truck driver? GoeticDisciple wrote: Who's rioting if they skip the scene coming up with Q and the truck driver? I would hate that. I have been looking forward to seeing Q take a nice long drink from someone's neck. For a while. Dose anyone know were I can't view issue 7 online? That, and the final battle... I'd like that to be pretty epic. Not just a scene where Eph screams "Zach" in the rain. There'd better be an entire issue dedicated to just the final battle. I'll hand you virtual tissues. Is that supposed to be Fet? yup! 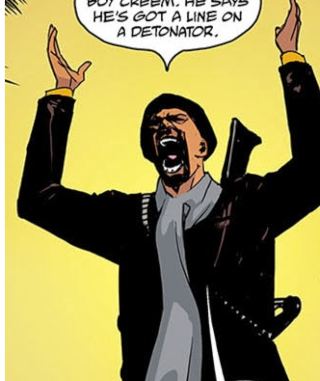 XD from one of the graphic novel panels. Ugh, I can't stand it. My least favorite part of the comics. Makes all the figures seem so vanilla and unappealing. Not that I need everyone to be appealing but the crudity of it really takes the appeal of the comics down a notch. Argh, Fet bby... so disproportionate! This one. It kills me every time. Quinlan looks like a friend of mine who is 100 lbs overweight and a complete dump truck. lmaoo yes,i wish del toro would just release a book with all the E M Gist illustrations instead...i'd be like here take mah moneh's!!! So re: the latest issue (thanks VampireEater for posting it~) I just have a few things to yap ahout. Gus seems to be obscured in shadow an awful lot. 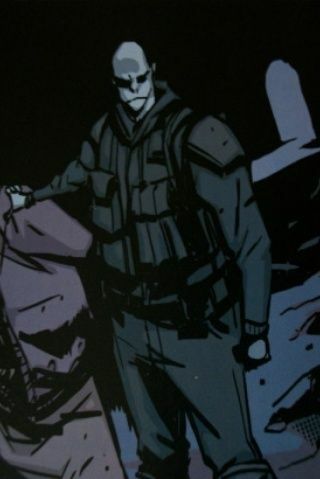 I mean, the artist used a lot of heavy shading, but I noticed Gus seems to have more. I mean, he's wearing a hat. But I was wondering if it was in part due to maybe his state of mind, or constant anger? If that's the case I'd expect Eph to be blacked out. :p Unless he was in the past, I haven't really been following graphic novel. "Dr. Vicodin"- world savior. Haha! Mr. Quinlan- having his Sloppy Joe Schmo and then politely tossing the uh, wrapper afterward. That's pretty much it for the moment. 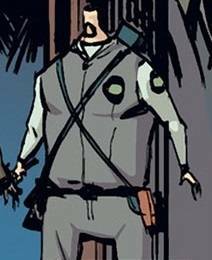 I noticed that about the way Gus is drawn, too. Feels like a cop-out. Seems like the artist just doesn't know how to draw his face in a variety of ways or he doesn't really like drawing Gus. But I did find this panel delightful. Look at that exaggerated mouth. Gus channels The Nutcracker. but yeah...he loves Q like we do so hence Q gets the better treatment...most times in terms of artwork. what pisses me off the most is that,the GN's started around the time the show did..so i dunno why both E.M Gist and Huddleston didn't just take references of the actors from the show...i would have/am going to for my comic at least.